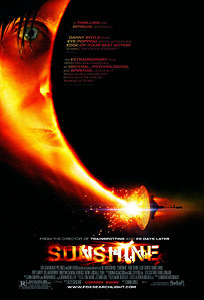 Sunshine (Director: Danny Boyle, UK, 2007): Last night, courtesy of the good folks at the Toronto After Dark Film Festival, I was able to catch the preview screening of Danny Boyle’s latest film, a sci-fi epic in the old-fashioned sense. Drawing inspiration from classics like 2001: A Space Odyssey, Solaris, and Alien, Sunshine doesn’t really chart any new ground, but it was a blast, and unlike most American sci-fi of recent years, it didn’t insult the viewer’s intelligence. We were fortunate to have the director present for a q&a after the screening (although he arrived from Chicago just in time for the end of the film) and he was refreshingly candid about the difficulties involved in making the film, as well as the very narrow thematic scope of films like this. As he put it, there is always a ship, a crew, and some sort of distress signal. Of course, it would make more sense for the crew to ignore the distress call, but they never do, and thank goodness, or else we’d be watching a pretty dull film. As it goes, the eight-person crew of the Icarus II, en route to deliver a bomb into the heart of a dying Sun, pick up signals from the Icarus I, lost seven years before. The film functions as an effective thriller and even enters the horror realm as the crew members meet various unexpected ends. We know at the beginning that their chances of returning to Earth are slim, but it’s still affecting to watch as they send messages home. And although the character development is minimal, there is still a strong sense of caring about these people, since they represent humanity’s last hope against the unfeeling machinery of the universe. In summary, this is not a classic in the mold of the three films it references, but it’s a great synthesis of their themes and shares the same atmosphere, which for me is a huge achievement. This is the sort of summer blockbuster I’d recommend to my own friends. The film opens in Toronto on July 20. This entry was posted in Theatrical Release and tagged scifi, space, Theatrical Release, uk. Bookmark the permalink. I’m very much looking forward to this as I’ve heard some positive reviews. I didn’t realize it was opening so soon after this early screening, so I’m psyched that I might be able to catch it this weekend. Gee, I dunno: it managed to insult MY intelligence. What I saw was a bunch of supposedly smart people doing incredibly stupid and nonsensical things until Alex Garland’s inexplicable and toxic plot devices came along and finished them off in that neck-twist of a third act. The man cannot write endings; furthermore, Danny Boyle would be well advised to hold the camera steady for more than three seconds at a time. “Sunshine” is a dismal pastiche of sci-fi cliches, for all the effort Garland supposedly expended avoiding such things; perhaps if he’d concentrated more on the story he wanted to tell than on the elements he wanted to avoid, we might have had a watchable movie here. A sad, pointless, head-scratching mess. Thanks for your input, Doug. And I can see your points. It’s just that I’ve never taken Danny Boyle all that seriously as a filmmaker. It’s not that I don’t like his films. Quite the contrary. But in his Q&A, he admitted that he likes doing genre exercises and putting his characters into extreme situations. Your Alex Garland comments might be valid, but I never saw The Beach, so I don’t have any other experience.